The Sin Bin Sports Blog: Can Brodeur And The Devils Keep The Cup Out Of Southern California, Again? Can Brodeur And The Devils Keep The Cup Out Of Southern California, Again? Last night, the New Jersey Devils qualified for the 2012 Stanley Cup Finals, when they beat the New York Rangers 3-2 in overtime to win the Eastern Conference Finals 4-2. This is the first time in ten years that the Devils have qualified for the Cup Finals, and things have a very similar feel. The Devils will face an opponent from Southern California who will be trying to win their first Stanley Cup in franchise history. In 2003, the last time the Devils made the finals, the then Mighty Ducks of Anaheim were the Cinderella story and trying to bring the Cup to the West Coast for the first time. Ultimately the Devils beat the Ducks in seven games and won the Stanley Cup for the third time in franchise history. Martin Brodeur out-dueled J.S. 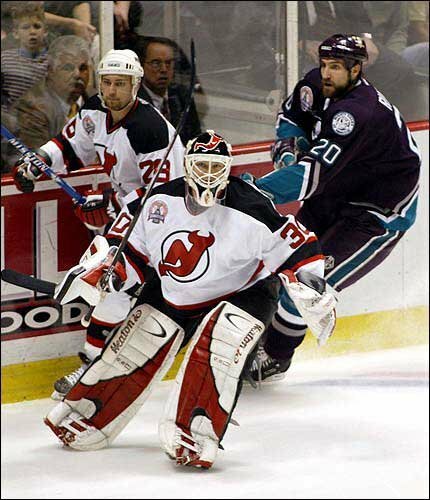 Giguere, although Giguere did win the Conn Smythe ad playoff MVP, Brodeur and the Devils lifted the trophy that mattered. Well here they are again, the only team standing between Lord Stanley and a summer vacation on the beaches of California. Both the Ducks and Kings finished the regular season with a total of 95 points and were seeded towards the bottom of the Conference, the Ducks in seventh place and the Kings in eighth. But despite their low seeding, beat the top two seeds, the Kings the top three, and were able to claim the title of Western Conference Champions. The Devils will once again have to beat a team who has gone on an unprecedented run to a 12-2 record through the first three rounds of the playoffs. Brodeur will once again have to out-perform a goalie who has carried his team through the playoffs. Needless to say the Cup Finals will not disappoint. At the beginning of the post-season dance no one picked theses two teams to represent their respective conferences in the final round. However, both teams clicked at the right time and have not looked back. The puck drops for the final round of play on Wednesday, and until then, I'm sure Kings fans will feel a little anxious because of the similarities of the past, and Devils fans, well, they'll just continue to be Devils fans.